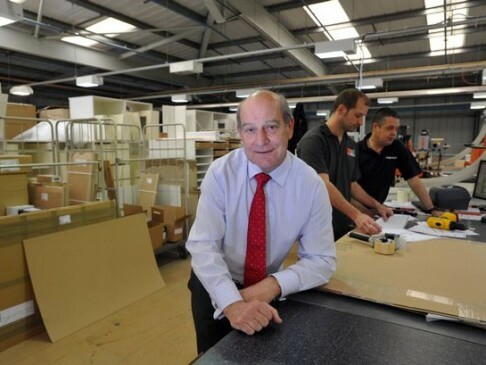 Brian Lakin is the founder and chief executive Sigma 3, the kitchen manufacturer and retailer based in Llantrisant. Over more than 40 years he has built the company from a shed on his uncle’s farm to the £20m turnover business of today, employing 200 directly and selling its bespoke kitchens through its own showrooms, 120 independent retailers around the UK and through builders. Mr Lakin – who left school at 16 and started his career making cabinets for relatives – spoke to Cardiff Breakfast Club about entrepreneurship. Here’s what he said are the 10 things an entrepreneur needs. You’ve got to want it and instinctively feel the drive. That’s the nature bit and is what happened to me, but I also believe it can be nurtured, the two terms nature and nurture can be connected and are not mutually exclusive. Absolutely crucial and I benefited from that. You need the support of your partner and the rest of your family. You can enjoy the successes together, but they also help you through turbulent times. This is a little bit of a gripe of mine. I think we need a culture change in this country in relation to selling. I often hear salesmanship being used in a derogatory sense. I think that’s completely wrong. I continually remind many of my internal staff that nothing happens until you sell something. There are no jobs in distribution, accounts, manufacturing, and we should applaud good quality, high level salesmanship. You won’t know everything, and of course you can get advice. Much of that advice can be very sound. But the number of times I’ve been told, at the end of the day, it’s your commercial decision. Older people may remember John Harvie Jones, who used to be chairman of ICI and used to have a TV programme called Troubleshooting, going round to different businesses and trying to give them advice and indicate how they could improve. He said it’s often much harder to run a small or medium-sized business than for him to run a conglomerate like ICI, because he had access to all the technical advice and support of key people in his business if he had a problem. Often in a smaller business you just have to make that decision yourself and trust your gut. Trusting your gut comes with confidence, and often that is correlated with madness. Confidence for an entrepreneur is crucial. Lots of times I’ve had people looking at me saying, he must be mad, why is he doing that? Of course, some decisions can turn out to be rash and impulsive. Other times hopefully they’re inspired and the right decision has been made. But if it does turn out to be madness then you’ve got to be prepared to pick up the pieces. You need that backbone and determination and the toughness to deal with the varying conditions and situations that you might be exposed to. Fate handed us the ultimate test in January 1995. It was a Friday evening and I was sat around the dinner table with my family when I got a phone call to say the factory was on fire. That resulted in the total destruction of our factory over the course of the next few days. We had 13 fire engines on site and the factory burned for 13 days. We managed to save some of our records but our plant and stock, including computers and vehicles, were totally destroyed. But customers were still placing orders with us in our showrooms, so we had the support of customers but I knew we had 100 families relying on us. The insurance company told me recently that 96% of companies would not have recovered form that disaster, but we got up and started again. As the business grows, the skill sets become more sophisticated and you need a stronger team and the team building capability and leadership comes into stronger focus. That fire certainly tested those characteristics and we came through with flying colours. Continuing professional development is necessary for us all these day, so I might not have gone to university but I certainly believe I’ve been to the university of life. The pace of change is immense and there’s no room for complacency. Yes, you seek from outside but I like also to try and promote from inside the business. My right hand man is someone who joined the business 27 years ago and left after 12 months. I missed his talent. Fortunately he came back and I didn’t it the second time around and he has had an enormous impact on our business. That’s always encouraged to try to make sure that we’re looking for the talent within our organisation. Try to spend time with people, try to get your managers to spend time with people, talk to the individuals and find out their skills. You’ll be immensely surprised by the talent that is right on your doorstep. Knowledge and experience are important, but the things you’re looking for are intelligence, motivation, personality and energy. If they’ve got the knowledge and experience fine, but you can always build them up, but if they haven’t got the first four you’ll struggle. If you want sustainability, don’t forget that loyalty works both ways. I have an issue these days with the vast differentials in pay in many organisations between the top and the bottom. I understand the need to reward the movers and shakers and the achievers, but I think we have a disproportionate imbalance now that has developed over the past 15 years that doesn’t help in growing organisations in the long term. Brian Lakin addressed the Cardiff Breakfast Club at the Swalec Stadium. The event was sponsored by Blake Morgan, Cardiff Business Council, Lloyds Banking Group, Stills and Media Wales.